I found the concept of ‘Album of the Year’ night to be a difficult one to get my head around. What to take? My two favourite albums from the year – Bill Callahan’s Apocalypse and Smoke Ring For My Halo by Kurt Vile (an album whose brilliance has taken me by surprise as the year has progressed) were coincidentally both played at the same club night (round 5). What’s more, I have bought so little music from 2011, mainly because I have so enjoyed trawling my existing collection looking for potential offerings for the club, that I feel my meagre offerings on Tuesday night were somewhat paltry and predictable. In the end I took everything I have bought from this year (a massive eight or so LPs) yet I brought nothing that neither one of Rob or Nick hadn’t already heard and, in the end opted to play Strange Mercy more-or-less by default. Whilst I like Strange Mercy a lot, I feel it is some way off the brilliance of Annie Clarke’s previous two offerings, especially Actor. Whereas Actor felt spontaneous and fresh, Strange Mercy seems to me much more mannered and manicured. On Actor the dissonance seemed integral to the songs, on its follow up it feels clunky at times (Northern Lights, Chloe in the Afternoon, Year of the Tiger), at others it comes across as embellishment, giving it a ‘tacked on’ feel. I can’t imagine Marrow (from Actor) without the guttural, bone shaking saxophones tearing it apart. Strange Mercy’s Champagne Year however (a nonetheless wonderful ballad) has some great sounds working their way into the last part of the song but I feel the song would work just as well without them. 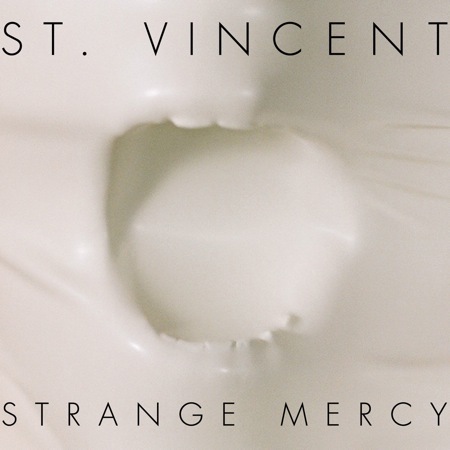 I shouldn’t be too disparaging though, there is some fantastic stuff on Strange Mercy. Cruel is literally awesome, the title track is beautiful yet visceral, Neutered Fruit and Dilettante take St Vincent’s music into new and exciting territory and Annie Clarke needs to be applauded for developing her sound and music, taking risks and seeking to experiment. It’s just that with one of the best albums of the last decade in the bag, my expectations were, perhaps, unreasonably high for its successor. Nick listened: This is one of my favourite records of the year, quite easily – I ranked it third in my top ten the other week, and live in Bristol in November (also attended by Tom) she was very good indeed. I’m not sure if I like Strange Mercy as much as Actor yet, but it’s a different beast; it feels a little more mannered, artful, and strange (not that Actor is lacking in those qualities). Glad Tom played it; I’d brought it along and had been debating choosing it myself. Rob listened: Still smarting from having missed St Vincent’s recent show in Bristol thanks to a broken car (anyone want 2 tickets? ), I came to the new album, which I had intended to pick up at the gig, expecting something deliriously challenging, based on my apparently erroneous reading of a handful of reviews on its release. Tom and Nick led me to believe that the first track, ‘Chloe In The Afternoon’ would ram my head through a musical mincer and that the rest of the record would afford me scant opportunity to reassemble my shattered sensibility. I thought the album was bold, bright, charming and really rather lovely. They seemed disappointed with this.